Tom Ward is the president and CEO of the Oasis Center in Nashville, Tennessee. Tony Majors is the chief support services officer for Metropolitan Nashville Public Schools. Even now, Sarah, an African American parent, finds it hard to be in the school without it causing her significant angst. There are few recollections of school that make her smile. When she receives an invitation to see her child perform in a school concert, she freezes at the very thought of being back in the school building. On the day the phone call from the school came, Sarah was reluctant to even answer. The caller ID told her who was on the other end. Resisting the urge to be unavailable, Sarah grabbed the receiver and in her shy voice said hello. “Ms. Jones, this is Mrs. Richardson, the assistant principal. I am calling to tell you what happened at school today. ” Sarah was not surprised at what came next. She had gotten these calls before. Mrs. Richardson went on to say that she would need to come pick up her son, and he would need to stay home for ten days. When Sarah arrived at school, she learned that there had been a fight between her son and another child. The other boy had been given a reprimand and sent back to class. His mother had been there for the investigation. Since her son was considered the aggressor, he was to go home. The other child was only defending himself, the assistant principal said. He was merely guilty of not exercising restraint. When Sarah asked questions as to the details of the altercation, most of the answers were short and absent of significant detail. What was apparent was that the decision had been made and she was not going to play a role in the resolution of the situation. Her son was once again the villain, and she would not know how to help him feel any sense of fairness with regard to how he was treated. Any chance she had of helping him take responsibility for his actions was lost. The fact that the other child was White and had his mother present for the interrogation confirmed for her what she experienced over her years of schooling. Sarah’s story is all too familiar. Her kind of experience represents a trauma that has etched itself into her memory and made her unable to see school as a viable partner. In her own education, she viewed school as a place that made demands and created expectations that required nothing more than compliance. In short, the school did things to her and not with her. And in her eyes, this narrative had simply continued with her own son. In the last ten years, Nashville has grown as fast as any city in America. We are no longer a “small,” sleepy, Southern town known solely for its country music, hospitality, and Southern cooking. We have become a thriving urban center, home to nearly 150 language groups and residents from 120 different countries. Data from the 2014 U.S. census show that 78 percent of Nashville residents identify themselves as White, 15 percent Black, 4 percent other, and 2 percent Asian. In contrast, the school system’s demographics do not align with the city’s census data: 43 percent of students are Black, 31 percent White, 21 percent Hispanic, and 4 percent Asian. Nashville is one of the few urban school systems that is still seeing annual student enrollment growth. The complexion and complexity of our community has changed significantly, revealing that our community issues – right down to our school discipline data – now compare with those of larger cities like New York, Los Angeles, and Chicago. In the 2014-2015 school year, African American students represented only 43 percent of enrolled students but accounted for 63 percent of all discipline incidents, 70 percent of out of school suspensions, and 77 percent of all expulsions. As the school system continues to improve the academic performance of schools, it has become clear that disproportionate disciplinary practices negatively impact student and school performance. When the school system was asked by the Annenberg Institute for School Reform at Brown University to take part in its Positive and Safe Schools Advancing Greater Equity (PASSAGE) initiative (for more on the initiative, please see the preface of this issue), it wasn’t easy for us to acknowledge that our Southern heritage coupled with our city’s recent growth has compounded long fostered racial inequities. However, we recognized that we were being given the incredible opportunity to honestly dig into our data and truly challenge the dominant paradigms on racial disparities and their long-term effects in our schools and the community. While the Metro Nashville Public School system (MNPS) had previously invested in and developed many initiatives designed to address the conditions of learning for all students, the issue of disproportionate disciplinary practices present in our district had yet to be formally addressed. Through PASSAGE, we convened a variety of public school stakeholders who sought to address this problem through a collaborative approach. The group includes representatives from the district (Tony Majors, a co-author of this piece), community organizations (Tom Ward, the other co-author of this piece), law enforcement, and juvenile justice, as well as principals, teachers, and students. Together our goal is to create a learner-centered environment in which careful attention is paid to the knowledge, skills, attitudes, and beliefs of all stakeholders in our schools. This approach explicitly acknowledges that all the voices of the affected parties are essential to (1) understand and embrace the complexity of the issue of discipline disparity, and (2) create corresponding interventions that address the experiences of each stakeholder. This requires that no issue be defined and no approach designed without intensive conversation or investigation. To be “learner-centered” is to acknowledge and then build on the concepts and cultural knowledge that each participant’s unique perspective brings to the environment. We believe that true synergy occurs when value and attention are collectively given to the power derived from having all voices involved. It is only through this collective, inclusive approach that we can ensure that stories like Sarah’s and her son’s disappear and that each child’s school experience is positive and enriching. We would have open and hones​t conversation. We would not sacrifice the safety and security of our students and schools. We would not hide the truth; our data was ours and we had to own it. PASSAGE was not just about disciplinary practices but about how we view and treat all youth. There would be no self-serving members of our committee that sought to advance their own agenda. Tier 1: We developed a steering committee to serve as the leadership team. To support the belief that our work was both a school and community responsibility, we (Tom Ward and Tony Majors) served as co-chairs. The steering committee consisted of representatives from nonprofits, the state Department of Education, law enforcement, the Department of Children’s Services, and the school system, as well as principals, elected officials, and the Juvenile Court judge. These people were not only representing their organizations; they were people with community leverage who were not just there because of their titles. In addition to the members of the steering committee, we added an assistant’s position to document and record our efforts and a data analyst currently working for the school system to compile all data reports and monitor the impact of our work. Tier 2: The steering committee members were then tasked with co-chairing and developing subcommittees that addressed the issues we faced. Each subcommittee was comprised of ten to fifteen members meeting similar criteria as the steering committee. Diverse and inclusive voice was essential. Engaging students and parents in the work of PASSAGE is essential. Listening to their voice and then positioning them to participate in their schools in an authentic and sustained way are at the heart of this subcommittee’s work. Policy is the overarching tool that, when crafted correctly, can set the tone for a school system of youth development that holds students responsible in a restorative and productive manner. It can provide the assurance that the safely of all participants is the highest priority. Setting an inclusive and developmental tone is imperative. The legal systems must understand and partner with the schools to create a seamless philosophy based on a developmental and restorative approach. The series of actions and consequences that occur when students interact with law enforcement officers and court officials can reinforce either positive or negative attitudes about authority figures. They can also determine the trajectory of a child’s life as evidenced in the school-to-prison pipeline. Designing and training all legal representatives, particularly school resource officers, provides a strong opportunity to shape a better relationship for future encounters. Engaging the voices of all constituencies in our community will create the range of support and expertise necessary for true reform in our system, reform that is truly focused on the development potential found in our young people. By aligning agency resources to provide wraparound services to families, we can reinvigorate our most underserved communities. After all, getting our children prepared to start school and ready to compete at a high academic level is the responsibility of our community at large. School cannot only be about intellectual development. It must be about the development of social and emotional attributes that prepare an individual to live and function in the mainstream of our society. Isolation from resources and opportunity denies students the ability to understand how the larger community works. Attention to these developmental aspects of the whole child during formal education can remove barriers that limit growth and positive opportunities. The steering committee worked collaboratively to identify key community and school stakeholders to serve on each subcommittee, but each subcommittee co-chair was given the autonomy to develop the strategies that would be the most beneficial for their group’s work. From there, a distinctive feature of our approach in Nashville emerged in that we didn’t restrict participation in PASSAGE to steering committee and subcommittee members. Instead, a series of community forums were held over the course of the school year. Parents, students, community members, and school personnel were able to participate together in order to view the district’s discipline data, learn more about PASSAGE and the approach being taken in Nashville, and provide meaningful feedback to help inform our efforts. Please share your immediate thoughts on the data you’ve seen tonight. What would you like to be different regarding the schools’ discipline process? How can parents and the community assist schools as part of the solution? Parents were disappointed by the data, but generally not surprised. They knew anecdotally that equity was an issue, particularly for children of color. They supported their opinion with stories that reflected uneven punishment, with numerous accounts of suspension for one child and verbal reprimand for the other. Parents with influence were notified, while disadvantaged parents got no call – just a note and sometimes not even that. It was left to the child to inform the parent. Respect was a common theme. Most parents felt that a place to begin would be better notification about what the rules and punishments were before misbehavior occurred. Having a process in place that was applied equitably to all situations no matter who was involved, and being included in the investigation and the resolution, would treat parents as partners rather than adversaries. Inclusion and voice in determination and resolution were common reoccurring themes. Each subcommittee identified what they felt needed to occur around their section of our work. For example, the district policy subcommittee discussed our district’s discipline handbook, investigated handbooks from other cities, and eventually created a new student and parent handbook. The law enforcement subcommittee discussed their treatment of youth in and outside of schools. Their intent was to create a more holistic model for legal intervention. A new model of selection for school resource officers (SROs) was discussed and a retraining of all selected officers was designed. Court intervention teams were created for first-time offenders, and social services were aligned for deployment. The social-emotional learning subcommittee led the charge to determine how to bring the tenets of social-emotional learning and restorative practices deeper into our schools and community. They engaged the voices of students enrolled in MNPS’s Alternative Learning Centers, which provide educational services for students who have been expelled, and participated in a site assessment to determine the culture and feel of various schools. 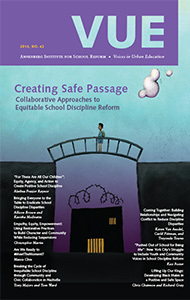 These “school climate walk-throughs” served to document evidence of (1) serious gaps in the effectiveness of current practices; and (2) best practices occurring in some schools, which can become systemic in developing the whole student and supporting teachers who need new skills to deal with challenging situations. At the three public forums held by the student-parent voice subcommittee and community engagement subcommittee, special groups were formed to capture youth voice. These sessions were a part of a carefully structured Youth Participatory Action Research (Y-PAR) project.1 In addition to these groups, there were focused sessions at the middle schools and high schools that were most affected by the district’s disciplinary policies. Overall, these voices provided multiple perspectives on current conditions in our schools and community. What they had to say greatly impacted our future course of action. It is important to acknowledge here that the journey has not been completely smooth or even without significant pushback. Getting people to the table in the beginning and keeping them there throughout the process was a challenge. Principals and community leaders alike identified lack of time as a hurdle to meeting or implementing the new products created by those subcommittee members who were willing and able to meet. Our decisions to proceed even when subcommittee member engagement was inconsistent or non-existent created a predictable response when implementation in the schools occurred: “I did not have input!” “You did not give me an opportunity to be involved!” These were phrases we heard particularly when the time came for the rollout of the new student and parent handbook. In the face of such comments, those of us who stayed the course moved forward believing that having a new model to refine was better – much better – than the status quo. At times, public criticism and our tough student data made those of us at the table representing the district feel very defensive and ready to adopt a mantra of self-preservation. Many were resistant when pushed to provide training for mixed cohorts (parents, teachers, police, and school administrators) on restorative practice and social and emotional development. The difficulty in scheduling, the fear of what would be said, and, most of all, leaving the outcome to chance, were all at the root of why such training was deemed “not possible.” The school system continued to schedule trainings without community participation, arguing that it was better than having no training at all. The impact of this lost opportunity to engage all stakeholders in training simultaneously is not completely known. In our conversations about such training, we never fully fleshed out what it meant to create the genuine synergy many of us felt was necessary in order to make our work a lasting effort rather than another quick fix. Our practical concerns of time and scheduling have thus far kept us from truly exploring deep-seated fears such as losing power or losing control of outcomes, which are often the first responses to the suggestion of a new paradigm. Moving forward is the greatest challenge of the whole project. Exactly where do we go? How do we create and sustain authentic parent and community partnerships? Thus far, our work has succeeded because, even with pushback and occasional disengagement of involved members, many have participated in an open and nonjudgmental manner. People have respected and listened to those who see things differently, especially those who have been ignored for so long. How do we make this the norm? What does our agenda look like moving ahead? An initial framework with several key themes has emerged. We must let the data drive the journey, reviewing what experts have identified as successful, relying on the voices of those most effected to guide the design of desired outcomes and hold everyone responsible and accountable. First, we will identify the cluster of schools that presents the greatest opportunity for improvement as reflected in the data on discipline, court activity, crime, and economic status. This cluster will establish the launch area for authentic parent/community involvement and will be used as a prototype for systematically rolling out the process to other clusters. The model will solicit very specific participation from parents most affected by disciplinary policies. The key to success here will be building genuine, sustained partnerships. A system of restorative justice training including parents, teachers, high school students, and community leaders together will be designed and instituted for all school communities. The system will be a part of an ongoing structure that expects all stakeholders to participate and contribute to the continuous development of a culture that values all children. These trainings will be presented as an orientation to school life for first-time parents and parents new to the community. Schools and communities will be encouraged to work together to build consensus around what the educational and developmental journey should look like for each and every child. Impatience, fear, and expediency are the enemies of this kind of work. What happens when we acknowledge that we have much to learn and that we must change? Perhaps the solution is “too hard” or “costs too much”? What happens if we determine that this is really a “values and beliefs” conversation? It is our hope that we will go forward, with all stakeholders together continuing to listen, learn, train, and work in the collaborative, learner-centered spirit in which PASSAGE Nashville began. We will continue to push ourselves out of our comfort zones and create lasting, positive changes in our community and school system. We believe that only when we all acknowledge and participate in this effort will we find new and more successful ways to guide and develop all our children. As we reflect on Sarah’s story, we realize she is all too typical of many parents who remember their own education as a traumatic journey, and now are facing the same issues with their children’s education. What will it take to erase the effects of these experiences so that she can advocate and participate fully as a partner in creating a different story for her child? For more on the Oasis Center’s work in Nashville, see https://www.oasiscenter.org/. For more on Metro Nashville Public Schools, see http://www.mnps.org/. 1. Participatory Action Research is a method of research in which participants impacted by the problem under study are involved in all stages of the research process, collaborating with one another and with researchers to develop the skills and knowledge essential for understanding and taking action on an issue.